After you reach Port Blair, meet our tour representative at the Airport/ the Harbour. Get an assisted transfer to the resort/hotel. Complete the check-in formalities and later you can relax for a while. You and your spouse are simply going to fall in love with this pristine place called Port Blair, bounded by craggy coastline and thick jungles. This is an ideal honeymoon destination, away from hustle-bustle that is often seen in the cities. Today, you are set to visit the popular attractions of Port Blair including Anthropological Museum- it houses displays such as handicrafts, tools, utensils, art and habitat models of the tribes belonging to Andaman & Nicobar; Cellular Jail or Kala Pani- constructed in 1906 by the British, it was used to jail political prisoners during the freedom struggle and Science Centre- a place consisting of gallery that has interactive displays showcasing genesis of the Andaman & Nicobar Islands, oceans and their science, volcanic activities, modern technology, open air science park, fun science gallery, butterfly corner and Taramandal. Sightseeing is followed by a visit to the Corbyn’s Cove beach- one of the busiest beaches in Andaman. Hold hand in hand and enjoy a leisure walk here as this is just the perfect place to whisper sweet nothings into each other’s ears. The evening is scheduled to attend the Light and Sound Show at the Cellular Jail. This show is a representation of the sacrifices made by the freedom fighters to make their country free from the clutches of the British rulers. On day 2 post breakfast, the day is scheduled for exploring the amazing Islands in the vicinity of Port Blair. 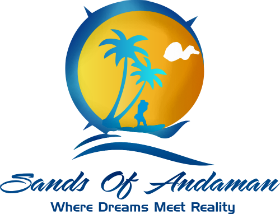 The first Island in the list is Ross Island, get into a boat from the jetty to arrive at the former capital of different Andaman Islands. This island famed for the mesmerizing beauty was also the site of the erstwhile Japanese POW camps. This visit is followed by the exploration of Northbay Island, also called Coral Island. 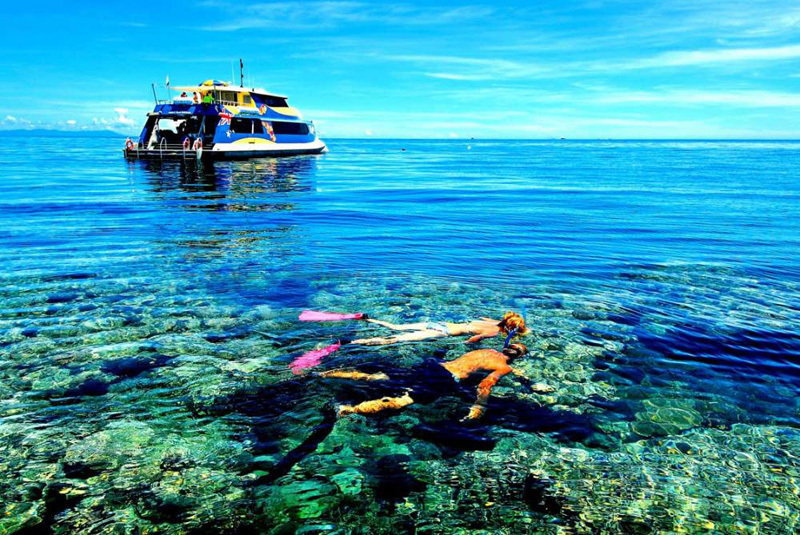 You are going to fall in love with exotic under water corals and marine life of this Island. Enjoy a ride in a glass-bottom boat and you will a superb view of the marine life here. This site also offers opportunities for scuba diving and snorkeling. Back to Port Blair in the evening. Stay overnight. On the 3rd day of the tour, you have your breakfast and get transferred from Port Blair to the very beautiful Havelock Island filled with serenity via a luxury cruise. After you arrive at the Island, you are escorted to your resort for check-in. After this, you are now free to spend the day as per your own liking. Indulge in fun activities together. You are going to get smitten by the white sandy beaches and shiny clear water of this Island. If you both love water sports, partake in Kayaking, snorkeling and scuba diving. Treat your eyes to scenery and relish the serenity sprinkled all around. Today, after breakfast, get all set to explore the very famous Radhanagar Beach, termed by Times Magazine as the ‘best beach of Asia’ and ‘number 7 beach in the world’. This picturesque beach is perfect for relaxing and leisure walk. Just lie down on the beach and enjoy sun bathing. Swimming is the other activity that can be done here. Radhanagar beach offers memorable sunset views. Spend memorable moments with your spouse here. Overnight stay at Havelock Island. On the 5th day, post Breakfast, you visit the well-known Elephant Beach for the day. Some of the best features of this beach are varied marine life, stunning corals, and blue and green clean water. This beach is a mix of leisure and water sports. You can spend leisure moments doing sunbathing here along with enjoy activities like snorkeling to explore the under-sea world. The atmosphere and natural beauty would be soothing here. Return to Port Blair in the evening, check-in at the hotel/resort. Today is the last day of your Honeymoon to Andaman tour. Get an assisted transfer to the Airport to board the flight for your onward destination.